Trigger at least 3 of the same symbol on adjacent reels and you are rewarded with 10 free spins and a special Bonus Expanding feature that comes into play during the free spins round. Free Spins can be re-triggered, without limit, during the free spins round. It is interesting to note that the Golden Book can also act as the scatter. As mentioned there are 10 pay lines and these are flexible so you are able to change at any time the number of lines you want to activate. Additionally you can change the value of your bet per line. The minimum bet is displayed at the bottom of the screen and by operating the + /- button so you can decide the value of your bet. 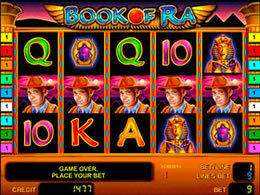 As mentioned the legendary mysteries of ancient Egypt will have an appeal to many players but if you have not had that experience then the Book of RA is certainly worth trying!